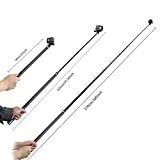 Take your selfies to a whole new level, literally, when you snap a pic high atop this cool new Panoramic Selfie Stick. 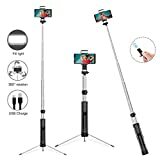 This massive 10 foot long oversized selfie stick will let you take wide angle shots from far away using your smartphone and the included Bluetooth remote. 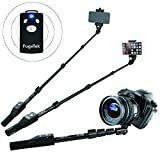 It's perfect for getting just about everyone you're with into the shot, like at a wedding or a party, great for capturing breathtaking panoramic scenes on your outdoor adventures, or just for taking pics of of things way from up high. 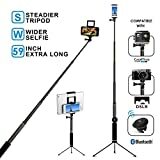 It features a spring action mount, holds phones up to 4.5", collapses down to 26" when not in use, and includes a steel tripod base. 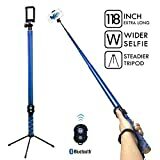 While it's not quite as impressive as a Selfie Drone, it would be quite useful for swatting them down when they become a nuisance. The future is just going to get more and more bizarre. 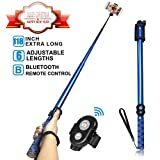 Holds phones up to 4.5"